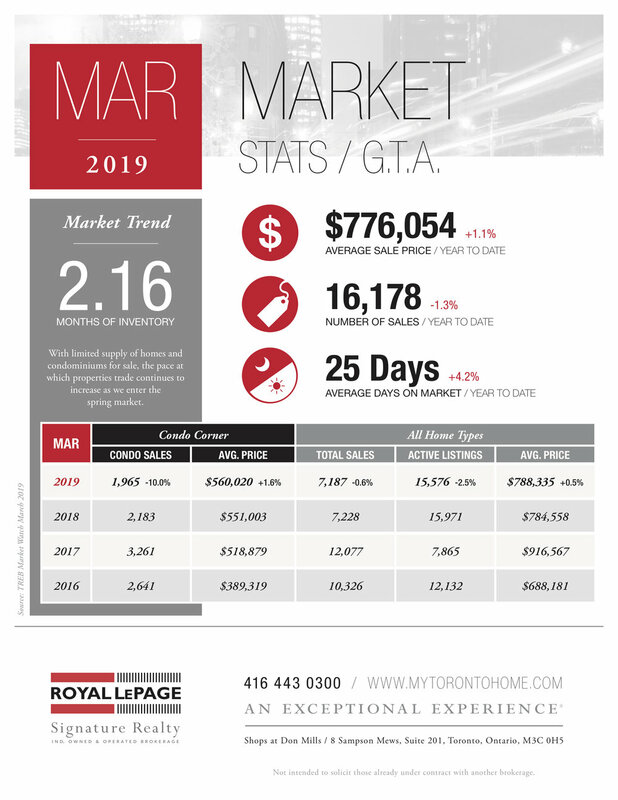 February 2018 market stats are here! The average sale price for the month was $767,818, down 12.4% compared to February 2017. Toronto Real Estate Board President Tim Syrianos announced that Greater Toronto Area REALTORS® reported 5,175 residential transactions through TREB’s MLS® System in February 2018. This result was down 34.9 percent compared to the record 7,955 sales reported in February 2017. The number of new listings entered into TREB’s MLS® System totaled 10,520, a 7.3 per cent increase compared to the 9,801 new listings entered in February 2017. However, the level of new listings remained below the average for the month of February for the previous 10 years. The MLS® Home Price Index Composite Benchmark was up by 3.2 per cent on a year-over-year basis for the TREB market area as a whole. This growth was driven by the apartment and townhouse market segments, with annual benchmark price increases of 18.8 per cent and 7.5 per cent respectively. Single-family detached and attached benchmark prices were down slightly compared to February 2017. The overall average selling price for February sales was down 12.4% year-over-year to $767,818. However, putting aside the price spike reported in the first quarter of 2017, it is important to note that February’s average price remained 12 per cent higher than the average reported for February 2016, which represents an annualized increase well above the rate of inflation for the past two years. December 2017 market stats are here! The average sale price for the month was $735,021, up 0.7% compared to December 2016. Toronto Real Estate Board President Tim Syrianos announced that Greater Toronto Area REALTORS® reported 92,394 sales through TREB's MLS® System in 2017. This total was down 18.3 per cent compared to the record set in 2016. Record sales in Q1 were followed by a decline in Q2 and Q3 after the Ontario Fair Housing Plan (FHP) was announced. The pace of sales picked up in Q4, as the impact of the FHP started to wane, and some buyers arguably brought forward their home purchase in response to the new OSFI stress test guidelines effective January 1, 2018. The average selling price for 2017 as a whole was $822,681 – up 12.7 per cent compared to 2016. This annual growth was driven more so by extremely tight market conditions during the first four months of the year. In the latter two-thirds of 2017, fewer sales combined with increased listings resulted in slower price growth. 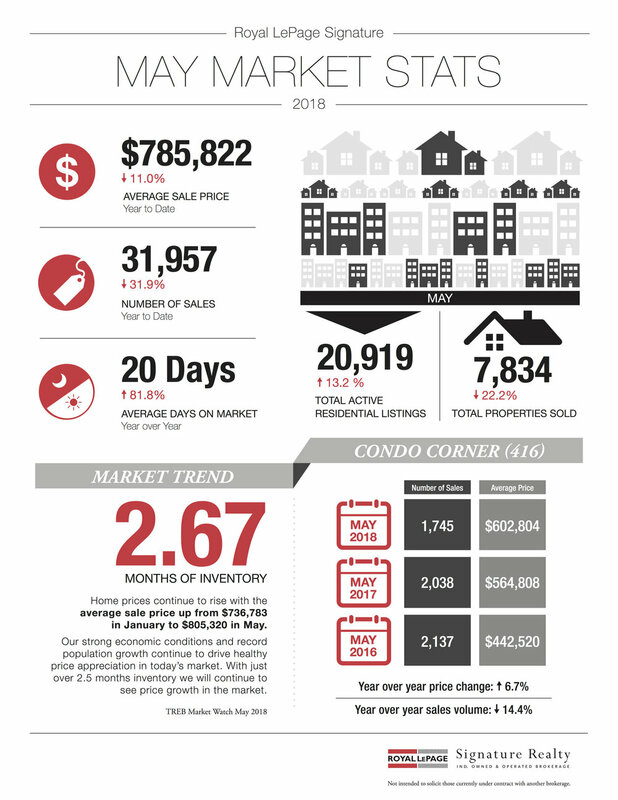 In December, the MLS® Home Price Index (HPI) Composite Benchmark was up by 7.2 per cent year over year, and the overall average selling price was up by 0.7 per cent year over year. November 2017 market stats are here! The average sale price for the month was $761,757, down 2.0% compared to November 2016. Toronto Real Estate Board President Tim Syrianos announced that Greater Toronto Area REALTORS® reported 7,374 transactions through TREB's MLS® System in November 2017. This result was up compared to October 2017, bucking the regular seasonal trend. On a year-over-year basis, sales were down by 13.3 per cent compared to November 2016. The MLS® Home Price Index (HPI) composite benchmark price was up by 8.4 per cent on a year-over-year basis in November 2017. The average selling price for all home types combined was down by two per cent compared to November 2016, due in large part to a smaller share of detached home sales versus last year. On a year-to-date basis, the average selling price was up by 13.4 per cent compared to the same period last year. High density home types continued to lead the way in terms of price growth, with the average condominium apartment price up by double-digits compared to November 2016. October 2017 market stats are here! The average sale price for the month was $780,104, up 2.3% over October 2016. The MLS® Home Price Index Composite benchmark price was up by 9.7 per cent on a year-over-year basis in October. Annual rates of price growth were strongest for townhouses and condominium apartments. September 2017 market stats are here! The average sale price for the month was $775,546, up 2.6% over September 2016. Toronto Real Estate Board President Tim Syrianos announced that Greater Toronto Area REALTORS® reported 6,379 sales through TREB's MLS® System in September 2017. This result was down by 35 per cent compared to September 2016. The average selling price in September 2017 was $775,546 – up 2.6 per cent compared to September 2016. The MLS® Home Price Index (HPI) composite benchmark was up by 12.2 per cent on a year-over-year basis. A key reason for the difference in annual growth rates between the average price and the MLS® HPI composite is the fact that detached homes – the most expensive market segment on average – accounted for a smaller share of overall transactions this year compared to last. "With more balanced market conditions, the pace of year-over-year price growth was more moderate in September compared to a year ago. However, the exception was the condominium apartment market segment, where average and benchmark sales prices were up by more than 20 per cent compared to last year. Tighter market conditions for condominium apartments follows consumer polling results from the spring that pointed toward a shift to condos in terms of buyer intentions," said Jason Mercer, TREB's Director of Market Analysis. For complete copies of TREB’s Monthly Market Watch Reports, visit my archives here. Toronto Real Estate Board President Tim Syrianos announced that Greater Toronto Area REALTORS® reported 6,357 home sales through TREB's MLS® System in August 2017. This result was down by 34.8 per cent compared to August 2016. The number of new residential listings entered into TREB's MLS® System, at 19,614, was up by 15.9 per cent compared to June 2016. While this annual rate of growth was sizeable, it represented a more moderate annual rate of growth compared to May 2017, when new listings were up by 48.9 per cent year-over-year. "We are in a period of flux that often follows major government policy announcements pointed at the housing market. On one hand, consumer survey results tell us many households are very interested in purchasing a home in the near future, but some of these would-be buyers seem to be temporarily on the sidelines waiting to see the real impact of the Ontario Fair Housing Plan. On the other hand, we have existing home owners who are listing their home because they feel price growth may have peaked. The end result has been a better supplied market and a moderating annual pace of price growth," said Mr. Syrianos. Annual growth rates for MLS® HPI benchmark prices have moderated over the past two months, but remain strong. The MLS® HPI composite benchmark price was up by 25.3 per cent on a year-over-year basis in June. June's average selling price for all home types combined for the TREB market area was $793,915, representing a 6.3 per cent increase compared to the same month in 2016. A better supplied market has certainly been a key factor influencing the moderation in price growth. "Recent Ipsos survey results suggest that home buying activity in the GTA will remain strong moving forward. The year-over-year dip in home sales we have experienced over the last two months seem to be the result of would-be buyers putting their decision to purchase temporarily on hold while they monitor the impact of the Fair Housing Plan. On the supply side of the market, it certainly looks as though buyers will benefit from more choice in the second half of 2017 compared to the same period in 2016,"said Jason Mercer, TREB's Director of Market Analysis and Service Channels. Toronto Real Estate Board President Larry Cerqua announced that Greater Toronto Area REALTORS® entered 33.6 per cent more new listings into TREB's MLS® System in April 2017, at 21,630, compared to the same month in 2016. New listings were up by double-digits for all low-rise home types, including detached and semi-detached houses and townhouses. New listings for condominium apartments were at the same level as last year. Total sales for the TREB market area as a whole amounted to 11,630 – down 3.2 per cent year-over-year. The MLS® Home Price Index (HPI) Composite Benchmark Price was up by 31.7 per cent yearover- year in April 2017. Similarly, the average selling price for all home types combined was up by 24.5 per cent to $920,791.